In styling terms, the Pampero has been considered to be the bridge between the Vallelunga and the Mangusta. Designed by Giugiara, the Pampero was, in principle, a convertible version of the Vallelunga with its spine chassis and wheelbase slightly lengthened; however, the body was completely new. Fitted with a 1500 cc Ford engine, the front end looked similar to the Mangusta, with the four headlights housed behind a chrome wire mesh grille. The dashboard was a 'V' shape for easy reading of the dials. The tail end of the prototype bore much resemblance to the Fiat 850 spider Giugiaro had designed when working for Bertone. The air intakes cleverly housed the fuel tank filler cap and handle for opening the rear end of the car. 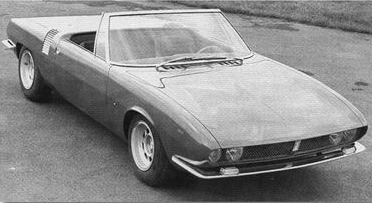 De Tomaso decided not to take the prototype into production for fear that it would not compete well against the Fiat 850 Spider. Conceived to carry four or five passenger in comfort; the Rowan was a small, eco-friendly city car, styled by Giugiaro of Ghia. The Rowan prototype was displayed at the Turin Motor Show in 1967 and was a significant styling step-change from previous electric vehicles displayed. The car utilised a General Electric engine, powered by a 6-volt battery and employed cast-magnesium components, including wheels, in order to lower the weight. Only a handful were ever built, as unfortunately, the world was not yet ready for a De Tomaso electric-powered vehicle. Designed by Tom Tjaarda, it is assumed that the Mustela was an attempt by De Tomaso to depart from his usual 'exotics' and create a 'mass market' model to interest a larger company into producing it under licence. The prototype was introduced at the motor shows in 1969, but even with the Mangusta style front and a side profile with similarities to the Pantera; the car did not get the interest from the manufacturers that De tomaso had hoped for. Shown as the 1971 Turin Motor Show, this De Tomaso 1600 prototype caused controversy at the time due to its startling similarity to the Fiat X1/9. The explanation given for this is that De Tomaso had shown Tjaarda a sketch of the proposed X1/9 from a magazine and asked him to design something in the same spirit. Although the 1600 spider-coupe much resembled the X1/9, the De Tomaso styling had a cleaner look to the rear panel, without the cumbersome engine hatch cover of the Fiat. Additionally, it had side air intake scoops that were more discreet and less protruding for the 16-value 1600cc Ford BDA engine, which was placed transversely across the car. The De Tomaso Zonda was designed by Tom Tjaarda and introduced at the Geneva Motor Show 1971. Built on a shortened Deauville chassis, the Zonda was to feature a front engined 5.8-litre Ford Cleveland V8. The styling of the Zonda bore similarity with (Ghia's) Giorgetto Giugiaro's design of the Maserati Ghibli. The Zonda had a low, long bonnet and a low-sloping rear roofline, with folding front headlights. Intended as a GT car to compliment the De Tomaso Pantera; Ford did not see a market for the car in the U.S. in its limited production numbers and so the Zonda remained a prototype. The De Tomaso Monttella also known as the Pantera 'II' or '7x,' was intended to be the next generation of the De Tomaso Pantera. Shown at auto shows during 1974, the vehicle shared the same chassis and drive train as the Pantera and bodywork designed by Tom Tjaarda. Unfortunately, due to Ford ending its involvement with De Tomaso in late 1974, nothing came of the new model. The prototype was later re-sprayed in pearl white over metallic bronze and the Pantera name replaced with Monttella. Ghia showed the vehicle to other manufacturers with the hope of putting it into production, but after five years without success the Monttella was sold. 1973 De Tomaso Montella. Image courtesy of www.supercars.net.